The world's great mystic poets have indeed been a select bunch. Many, if not true-blue homosexuals, were at least homoerotics or homophiles. Its hard to say exactly where the great Persian poet, Rumi, fits onto such gay-male scales, but its certain, at least, he loved—passionately-- a particular man—a man who inspired most of his greatest poetic work from start to finish. Rumi clothed devotion to God, as did his father, in sensuous language, making references to every day events and celebrating fleshly beauty. Present-day scholars are often shocked by the references that flowed like rivers from his uninhibited pen. 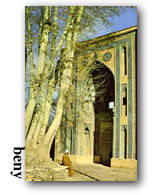 Rumi was born (September 30, 1207) in Balkh, now part of Afghanistan, but in those years a part of the Persian Empire. In 1215, when a child, his family whisked him off to Turkey, in flight from Mongol armies that had invaded their home region. The poet's new home—in those days—was called Roman Anatolia, thus inspiring the young mystic singer's chosen name, Rumi. In some respects, perhaps, Rumi followed in the footsteps of his father, Bahauddin (Light of the Faith) Walad, a mystic too, but also a jurist and a theologian. Upon this elder's death, Rumi became a sheikh, instructing a learning community of dervishes. Such dervishes were much given to ecstatic experiences, mind-states in which they attained what they believed to be absolute personal union with God, a concept that remains heretical in many Islamic and Christian circles. Life for the young Rumi was typical for religious scholars in his time, and consisted of helping the poor, spending hours in focused meditation, and teaching the rudiments of mystical spirituality to aspiring students. But in 1244, a wandering dervish, the legendary mystic, Shams of Tabriz, entered Rumi's never-to-be-the-same existence. Shams, it is said, had crossed and re-crossed the Persian Empire seeking Allah's help in the finding a friend who might be able to "endure" his companionship. After traveling afar a voice came to Shams in a vision asking him what he was willing to give up in return if he were granted the companionship of such a friend. "My head," he replied. The voice sent him thereafter to the town where Rumi resided. The two men united, the legends tell, after it was clear to each that neither would cease their journeying toward the divine by assuming it found in its entirety. One taste of the divine seemed, for most mystics, sufficient. But for both Rumi and Shams, "the way was always unfolding." "Their Friendship is one of the mysteries. They spent months together without any human needs, transported into a region of pure conversation." This relationship, according to Barks, "caused difficulties in the religious community" Other men, to whom Rumi had been close, felt neglected. In the midst of such controversies, Shams suddenly disappeared, leaving as unexpectedly as he'd arrived. Following this first departure, it is believed, Rumi's transformation into an artist- mystic began. He sang with gusto, danced in the realm of the spirits, and began to write poems that would last through the centuries ahead, inspiring not only his Persian countrymen, but men and women in faraway lands who generally described themselves as dumb-struck with awe at the insight and beauty his words conveyed. But Rumi missed Shams terribly. He discovered that his friend had gone to Damacus, and begged that he return. When they became reunited for a second time, the legends say, they fell at each other's feet so that "no one knew who was lover and who the beloved." Though both men were married (Shams married a young girl who'd been sheltered in Rumi's home) their relationship became so intense with its celebrations of mystic communication-- that jealousies—as once before—erupted. One night—in their room—on December 5, 1248, as they embraced with communicative fervor, Shams went to the back door where he'd heard a knock. He never returned to that room where his beloved waited, and, tragically, was never seen again. Thus did the union of these two men take place. Translator Barks calls the illumination Rumi experienced in Damacus fana , or "annihilation in the Friend." In the wake of this annihilation, Rumi called a collection of his many poems The Works of Shams of Tabriz. A second great love entered Rumi's life, a goldsmith, Saladin Zarkub. Rumi then addressed his poetry to this man with a tender intensity. But Saladin died too and Rumi took a third lover, Husam, claiming that he understood the "secret order" of the Mathnawi which Rumi's translator calls "that great work that shifts so fantastically from theory to folklore, to jokes, to ecstatic poetry." All six volumes of that work were dedicated to Husam, with whom he lived until December 17, 1273. It was on that day that Rumi passed into the eternal realms. Suggested reading: The Essential Rumi, translations by Coleman Barks with John Moyne, HarperSanFrancisco, 1996, paperback, 310 pages, $12.